Like disco and the dinosaur, passive sourcing is dead. 51 % indicate candidates have grown wary of emails from networking sites and respond at a much lower rate. 47 % indicate candidates respond to recruiter emails at a much lower rate. 44 % indicate candidates respond to recruiter phone calls at much lower rate. So, what’s going on here? Why is the supposed “next big thing” suddenly seeming like it’s dead in the water? Many factors led to the death of passive sourcing, but we’ve collected the 4 most crushing for anyone who is still hoping that passive will pull through this rough patch. Professional networks arose at a time when it was believed that social networks were for teenagers, not business people. Networks like LinkedIn allowed for a stripped-down social media experience, wherein professionals could network, display the work they’ve done and endorse each other for a job well done. Fast forward a couple years and most companies have abandoned the blanket “professional” identity for more human, appealing employer brands. This serves to lessen the differences between social and professional networks, except for one key difference. Passive sourcing runs on the profiles of hard working employees and, as your best employees will tell you, they are being contacted by recruiters on a monthly or even weekly basis. Professional networks have become completely saturated with recruiters who are trying desperately to pull a candidate out of the air. The frequency might make you think that it’s a built in feature of the network to be spammed by recruiters, and it is. By offering subscription based search tools, networks are offering up their users to the wolves, so to speak, and those users are getting tired of it. As we said earlier a majority of hiring managers are seeing much lower response rates for messages through professional networks, and this is precisely because of this recruiter saturation. While the point of professional networks is to display your skills and browse the profiles of employers you’re interested in, being active on these networks ensures that you will be contacted for positions that you are not looking for. While some people find this flattering, others find it annoying or simply look past these communications as easily as coupon offers. Content provided by friends and family is most trusted by 72%. This trust barrier hampers the effectiveness of passive sourcing, because trust is essential when creating a relationship that is strong enough to utilize for sourcing purposes. “Passive Candidates” are being asked to take a new job in a new city or a new state, but how long would you have to know someone to trust them with this sort of thing? A recruiter may know a passive candidate’s entire work history, but they still don’t know that person. The likelihood of strong relationships being formed is slim and the time that it takes to build these relationships is immense. This uncertainty combined with the certain time commitment required to build trust with candidates makes passive sourcing a dubious proposition at the best of times. Today, employers are facing new, complicated challenges that require specific, advanced experience and qualifications from the people they hire. While passive sourcing can identify professionals with these qualifications, it cannot identify professionals that are ready to be recruited. Even when passive sourcing does uncover a candidate who is open to a new job, there is no set procedure for moving this candidate toward accepting your offer and no guarantees of success. 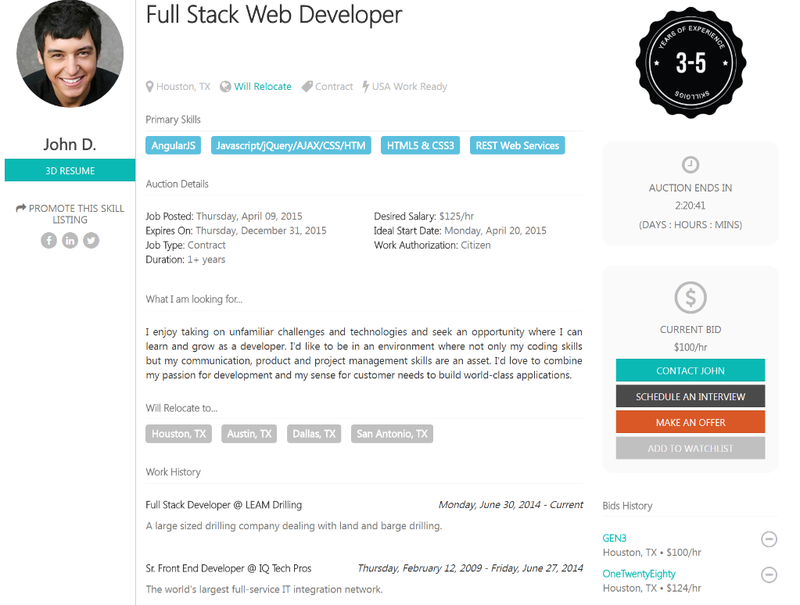 Enter SkillGigs, the first platform for candidates to market their skills directly to employers. Professionals create a profile to showcase their experience with specific tools as well as their industry experience. Unlike social network users, SkillGigs candidates are interested in a new job and are able to get specific with what they’re looking for in their next position. Along with a general description of their desires, candidates can set a “reserve price” on their profile, which is the salary, benefits and job location that would be required for them to switch to leave their current job. This eliminates uncertainty that was so common with passive sourcing. It’s a solution that takes both sides of the hiring equation into account, giving interested, high-quality candidates the platform to connect with businesses around the country and find the next step in their career. Employers, on the other hand, are able to search through a network of active, engaged candidates based on the skills that they need most, ensuring that they get the right talent to get the job done. You can access the SkillGigs Marketplace for Free Here.